This section is where we've collected all of the belly bars from our DiscoBall range. 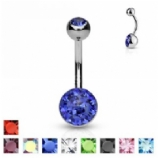 You'll find everything from the plain double DiscoBall belly bar in many colours, to hearts, smiley faces and even union jacks! The DiscoBall ranges features stunning, glittery creations for your navel - all made with genuine Swarovski crystals for the ultimate sparkle.